Month 7 at GWCMC. We have passed the six month mark! My parents were here for a 10-day visit. It started in Hong Kong where we had wonderful dinner of Peking duck and great conversation with one of my father’s college singing friends Ken Fung. It happens that when I was in China 30 years ago, my parents also visited Hong Kong and visited Ken. I flew to Hong Kong to meet them. In the 30 years that have passed many of his children have gone to school in Boston and amazingly, his son in law is the son of a well-known OBGYN in Newton. A doc that I had actually met and whose patients I have taken care of. The world is small sometimes. Hong Kong is an interesting foil for Guangzhou. The geography is quite different, more like San Francisco. There are clearly many more non-Chinese, and a very different culture. Because we had to bring my parents back to Guangzhou after dinner, we hired a van that was capable of crossing the “border” between Hong Kong and the rest of China. That in itself was a fascinating trip. The border crossing was quite perfunctory. It reminded me very much of the experience of traveling to Canada and back. We had a very interesting discussion with our driver about how many people in Hong Kong have very different views of the increasing control that the Chinese government is exerting over Hong Kong. He describes that it has in extreme cases led to divorces and much family acrimony. The next day, we left for a five day trip to Yunnan Province. We traveled to an area in the south of Yunnan that was a very close to the northern borders of Thailand, Laos, and Vietnam called Xishuangbanna. The pool patio of the Anantara Xishuangbanna resort. I was struck by the penetration of significant infrastructure development and urbanization. Like many places, there were certainly situations where the development appeared to be having a significantly negative effect on unique human cultures and very rich natural environments. There are more Chinese minority peoples who make their home in Yunnan province than anywhere else in China. The largest of these is the “Dai” people who we learned are closely related to the folks who migrated south during the growth and development of Thailand (“thai”, “dai” get it?) as an independent culture and nation. The visit to a Dai village was one of the highlights of the trip. We had a wonderful meal of traditional Dai cooking. The people we met more modern in many ways, but they clearly also have a strong connection to their roots as rainforest dwellers. The food was suffused with very interesting and delicious herbs and vegetables. In addition we visited the tree that is still considered the focal point of the village life. Our guide said that the tree may be more than 1000 years old and by the look of it that is not hard to believe! She describes that they have some idea of its age because there are oral histories that describe events known to have occurred more than 1000 years ago that mention the presence of this tree. 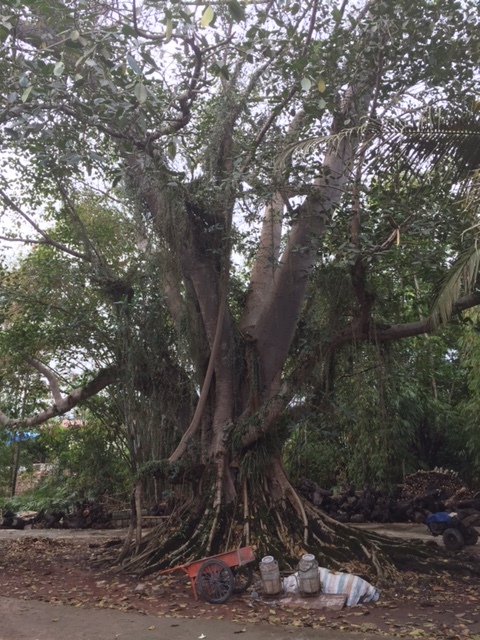 The ancestral tree of the Dai villiage we visited. It is reputed to be more than 1000 years old. It looks like it could be! After that, back to the Pearl River Delta mega-city. Thanks to an introduction provided by our family friend Susan Rockefeller, we were invited to tour a large, vertically-integrated shirt factory in one of the smaller cities about 1 hour from Guangzhou. Esquel is the brain-child of Margie Yang. It is a profitable, privately heldbusiness with more than $1,000,000,000 in annual revenue. Esquel invests a significant amount of capital and time to providing a nurturing work environment for their 50,000+ employees as well as working to make their manufacturing as sustainable as possible from an environmental point of view. As a result, their employee turnover is extremely low, and they make shirts for more than 20 highly recognizable brands. At GWCMC, The CEO’s vision is to go all-in as an academic medical center. The principal prizes are research projects/programs mature enough to support National Natural science foundation (think Chinese NIH + NSF) Every clinical specialty is tasked with developing in this way. Every faculty member is expected to participate in research and publication. There is a big focus on impact factors as a measure of publication quality/success. I didn’t know that much about it before, but now I can see that its quantitative nature has its allure. Unfortunately, it also has its problems as a measure for individuals and/or individual publications. More recently, a big scandal broke as one online, open access journal was forced to retract more than 100 papers simultaneously. Almost all were from Chinese authors and institutions. It seems that there was a very widespread fraudulent system of fake reviewers for papers. It was described that authors would submit plausible reviewers for their papers but give an email address that actually belonged to one of the authors of the paper who then wrote a very positive review. The fact that so many different institutions participated reflects poorly on the quality of chinese medical science at present. That is unfortunate for all of the seriously talented, professional and ethical work that is being done. Well, I think that is enough for now. I will write again when it had gotten really hot in humid here in Guangzhou. We are back for the beginning of fifth month in China after spending 10 days at home (yes, that is still the correct word) for the holidays. We made a short stop in Beijing and stayed at a marvelous inn in a restored "hutong" called the Red Wall Courtyard. The hotel was full of books, antiques and introductions to chinese culture. At dinner we were serenaded by a pipa player. We even managed to catch up with our friend Marianna's mom who was in Beijing on vacation! It was good to be back and good to acknowledge and appreciate many things that before were taken for granted. I am pretty sure my wife would put Dunkin’ Donuts regular coffee high on her list. Consistently efficient and customer centered service is probably what I noticed most. Eli was noticing he was having trouble reading Chinese characters on the blackboard in his Mandarin class. It required only a single afternoon to make and attend an appointment for an optometrist, choose a glasses frame from among hundreds in store and have lenses made onsite and finished glasses available - way to go LensCrafters! Returning home from far away helps me to appreciate the incredible extended family that I have in Boston. Below are some of my parent's closest friends. They are each extraordinary and adventurous and they have all known and nurtured me literally my entire life. Cowins, Scheers, Wolks and Kellers - with my parents in Brookline last week. The experience of traveling such a long distance certainly has its challenges but it is truly a technological wonder. I am old enough to remember the early "jet age". Now, thanks to inertial navigation, satellite communication, carbon fiber construction, and the 8- Sigma (not 6, 8!) manufacturing capabilities of GE, 150 million dollars will get you an airplane that is essentially capable of connecting any two 10,000ft runways in the same hemisphere in any weather while serving hot meals, drinks and snacks to 3-400 people entertained by their own individual media centers. That said, if someone can figure out how to make it possible to sleep in a coach airline seat, they should be awarded a Nobel Prize! At Guangzhou Women and Children's Medical Center, after a few months of orientation, I am now clinical and administrative leader of the urogynecology department. There are many opportunities for improvement, and one key will be to pick the correct pace and be able to read the comfort level of the care team that surrounds our patients. I am finding many examples in clinical care of routine patients, where it seems that the rapid improvement in the availability of technology, particularly imaging, has led to some potentially unnecessary medical procedures. This was certainly a growing pain that occurred in the United States. The first challenge is that an imaging test like a CT scan or ultrasound is statistically similar to ordering a hundred blood tests. Even though unrelated to the reason for ordering the study, each individual area of anatomy or physiology that can be assessed takes on a life of its own. It’s hard for physicians to remember, and difficult for patients to conceptualize that when the pretest probability of a disease is very low (for example, your doctor ordered a scan to check your liver and the radiologist notices a few kidney stones) most of the positive findings are false positives. The second problem is being able to see things that you were never able to see before in the evolution of a disease or the recovery from a procedure. If you perform an ultrasound on every patient the day after abdominal surgery you may find that many have collections of blood or fluid that might appear to be concerning. But the real problem is that before the availability of inexpensive and highly accessible ultrasound imaging, we weren’t able to see how inconsistent our surgical capabilities are and how often the body’s innate abilities and sensibilities manage to work our heavy-handed interventions into long-term gains. At home, our pets continue to nurture and challenge us. While we have been away, our two dogs have been at obedience “boot camp”. We will soon have to step up our own game in order to continue what Jacky Lai and his staff have started. Happy western new year to everyone – and 恭喜发财! (hint: cut and paste into Google translate).